Our next Full Moon will take the skies Sunday, March 12th at 10:54am EST. Native American folklore names March’s full moon the Full Worm Moon. Yes, you read that correctly — the worm moon. Think of how the ground begins to soften as spring takes hold on the earth, allowing the earthworms to emerge and inviting the return of the robins. Worms may not evoke positive associations for many, but they are a necessary and beautiful part of the ecosystem at large. The same could be said about our periods. Many of us were taught to think of our periods as gross. We picked up negative messages about our bodies and our periods without even realizing it. Perhaps you felt shame and embarrassment around getting your period because of the way your mom talked to you about it, or maybe she didn’t talk to you at all, just handed you a pad and expected you to figure it out. Or maybe it was the way the boys at school teased you and the other girls about it. I invite you to take a moment to journey back to when you were an adolescent — what messages did you hear about your period? What were you taught to expect? Did you have fears, unanswered questions, or negative experiences around menstruation? Our bleeding is sacred and beautiful. Did you catch that? Beautiful. It can be hard to see the value in something that has traditionally been put down, undervalued, and looked at as disgusting. But if we look for the hidden beauty and value of our bleeding, we find a wealth of Goddess knowledge and power. If it weren’t for our periods, we wouldn’t possess the powerful energetic life force inside us that births not only all forms of creative expression but can also create actual human life — it’s pretty amazing! Plus, when we tune into our experience of menstruation, we can learn a whole lot about our overall health. We can even discover changes to diet and lifestyle that we can make to transform our period experience into a more comfortable and positive time of the month. Since I started doing this work 10 years ago, I’ve noticed a distinct cultural shift. It used to be that women seemed only interested in their periods if they were trying to get pregnant. Now more and more women — whether or not they’re TTC — are drawn to learning how their bodies work and how to connect with and celebrate their menstrual cycle. I couldn’t be happier that this shift is taking place! 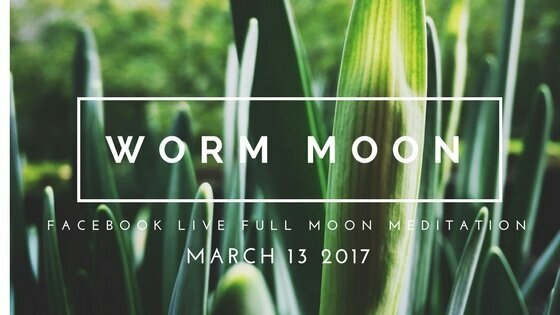 That’s why I want to invite you to join me for a Full Worm Moon meditation on the evening of March 13th. It would be my pleasure to guide you in uncovering the hidden beauty of your period. Join us!